The weather held up for us and some ladies did great in accumulating the least amount of trouble points. Fun golf rules for dog lovers! An amusing Rules incident occurred at the Alfred Dunhill Links Championship last Friday. 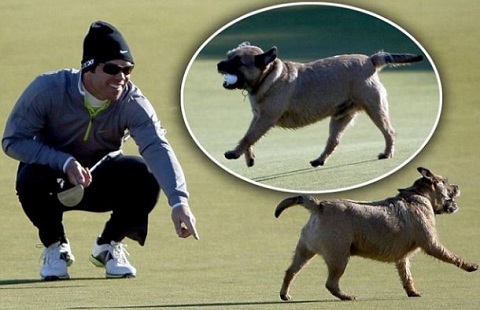 Paul Casey was eyeing-up an eagle putt on the par-5, 12th green at Kingsbarns Golf Links in St. Andrews when a dog picked-up his ball from the putting green and ran off with it. As you can see from the photo, Casey tried to persuade the dog to drop his ball, presumably nearer to the hole, but it ran off gripping it with its teeth. A sprightly spectator caught the ball thief on the 13th and retrieved Casey’s original ball, which he correctly replaced on the green where it had been at rest and took his putt. This was a simple application of Rule 18-1, which states;If a ball at rest is moved by an outside agency, there is no penalty and the ball must be replaced. Overall Low Gross Champion: Congratulations to Annette Krey! Gross score of 246 for the three rounds. As a second time winner we will be adding a diamond to her Low Gross Champion necklace. Also, $45.00 Pro Shop credit and a dinner certificate. Low Gross Winner: Lin Lenson with a gross score of 249 for the three rounds. Trophy and $45.00 Pro Shop credit/ breakfast/lunch certificate. Low Net Winner: Dana Wardstrom with a net score of 224 for the three rounds. Candle and $30.00 Pro Shop credit/ breakfast/lunch certificate. Low Gross Winner: Jill Chase with a gross score of 278 for the three rounds. Trophy and $45.00 Pro Shop credit/ breakfast/lunch certificate. Low Net Winner: Jeanne Zwemer with a net score of 225 for the three rounds. Candle and $30.00 Pro Shop credit/ breakfast/lunch certificate. Low Gross Winner: Cathy Surdez with a gross score of 313 for the three rounds. Trophy and $45.00 Pro Shop credit/ breakfast/lunch certificate. Low Net Winner: Susan Leeper with a net score of 223 for the three rounds. Candle and $30.00 Pro Shop credit/ breakfast/lunch certificate.